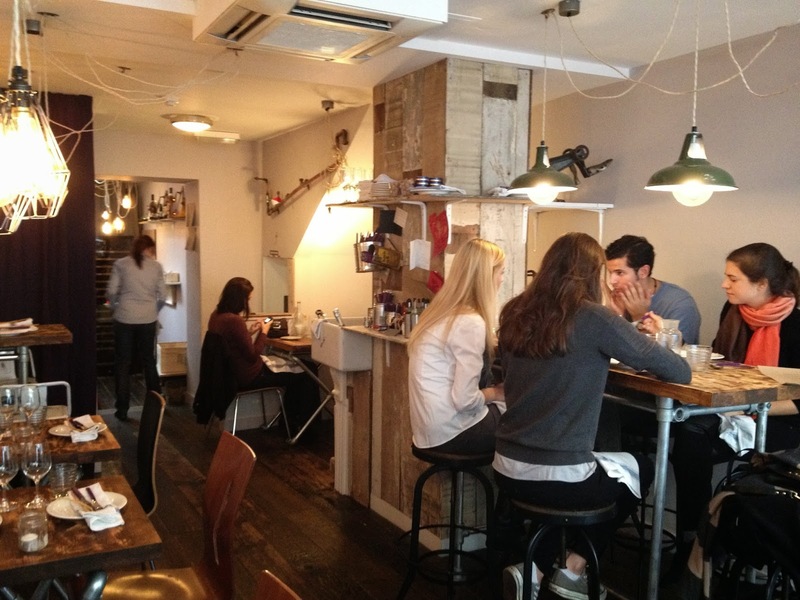 Cost: Small plates (to be shared) range from £2.50 to £12.95, desserts from £1.50 to £8.95. About: Pieds Nus is the pop-up restaurant opened in late 2013 just off Marylebone High Street by David Moore, owner of Michelin starred restaurants Pied à Terre and L'Autre Pied. I visited it for the first time in October 2013 with a friend soon after it opened, and enjoyed it so much I hurried back for a second visit last week. Pieds Nus has a laid-back and casual feel about it, the décor is unpretentious but tasteful, with subdued lighting creating a restful atmosphere. 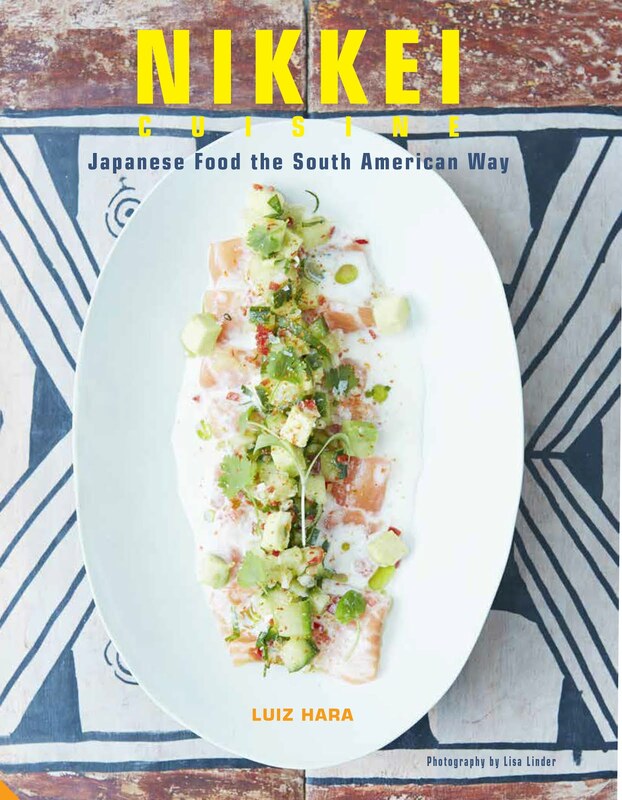 The idea behind Pieds Nus is to provide food reflecting David Moore’s culinary background in a less formal set-up. The menu is divided into 2 appetizers, 3 vegetable dishes, 3 fish and 4 meat dishes, all intended for sharing. 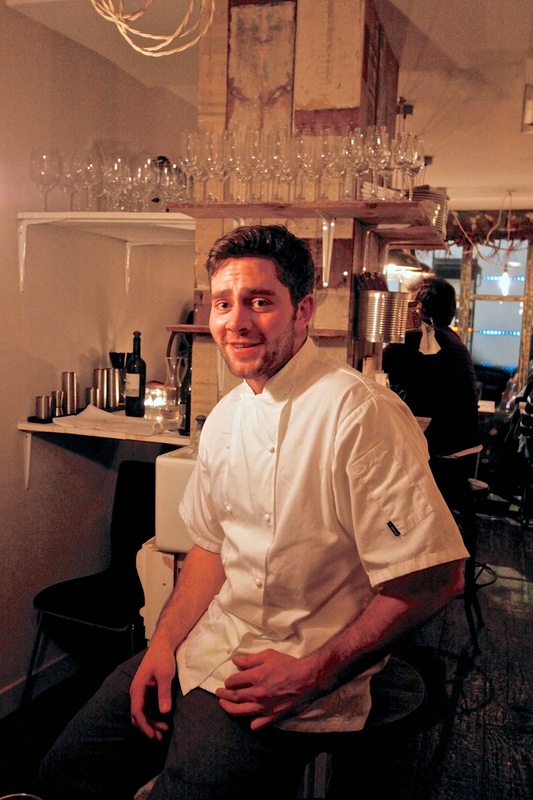 The head chef is Ed Dutton, who worked with David Moore at Pied à Terre on Charlotte St for two years, and was head chef at Tom Aikens Restaurant. Interestingly, the temperatures used for cooking the fish and meat dishes are stated against each item on the menu, 42°C for the confit salmon or 82.2°C for the spiced lamb neck for example (nothing being cooked over 100°C) indicating great care and thought for the ingredients used. What We Ate: Faced with a small but tantalising menu, and feeling somewhat indecisive, we opted to try the whole lot save for the desserts. We started with a glass of bubbly and a couple of appetizers - the moradas cornicabra olives (2.50) and a platter of thinly cut Iberian ham (Paleta Iberica D.O. 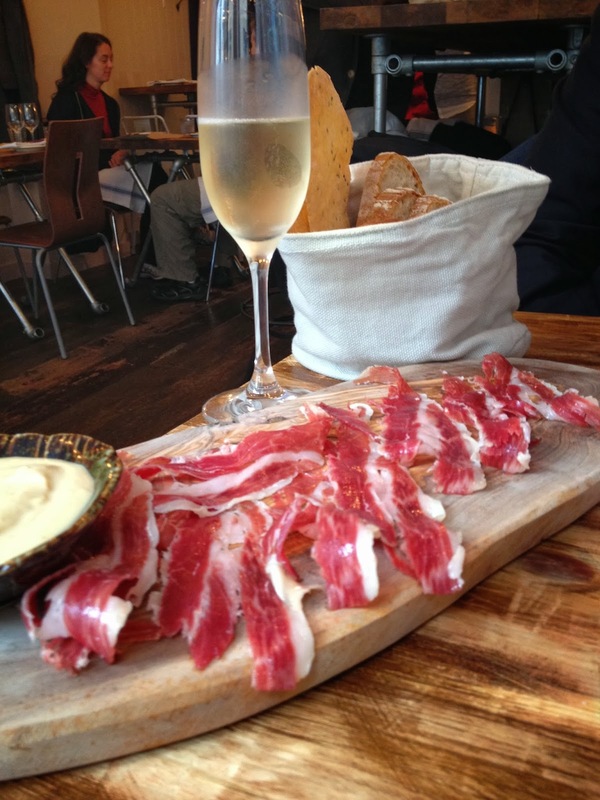 Bellota Reserva £10.95), made from top grade, acorn-fed Iberian pigs. The slivers were extremely fine and marbled, with a magnificent texture and flavour. To accompany our appetizers and most of our small eats, we also had a basket of warm and freshly baked breads (£4.50) including bacon and onion brioche, black onion seed flat bread, and milk loaf, which were fantastic with a serving of humus. Our first vegetable dish was the pickled, raw and charred vegetables with celeriac oil and truffle (£9.50), which was beautiful in its presentation, and had a joyous extravagance of crunchy, crisp and creamy textures. Baby artichoke, wild mushrooms and pine nuts (£7.50) was also very good, with the artichokes sliced in half and charred, and partnered with a medley of wild mushrooms. The slow cooked duck egg with riced potato and Belper Knolle cheese (£6.50) was probably my favourite of the vegetable dishes - light and airy, but richly flavoured with cheese and truffle shavings, all brought together by a lightly cooked and still very runny duck egg yolk. Alas the scallop dish was not available on the night we were there, but we didn’t do too badly ordering the seared yellow fin tuna with pepper and black olive (£12.00) instead. The tuna was wonderfully fresh and tender, and served as perfect, pepper encrusted discs on a bed of creamy mashed potatoes, black olives and chives. The confit salmon, gently poached in a water bath at 42°C, was luscious and meltingly tender served with deep-fried shavings of cauliflower and pink grapefruit (£8.50). The cucumber "noodles" were a refreshing addition providing also a surprising texture. The meat options started on an excellent note with the beef tartare with smoked eel (£11.95). I am sucker for good steak tartare, but this took the classic into new territory with the beef hand chopped, the raw egg yolk replaced by tiny crispy quail eggs, and a streak of wasabi cream to bring a touch of heat. Next was the 62°C poached rose veal with celeriac choucroute and truffle (£12.95). This was my favourite of all the meat dishes; the veal was tender and delicately flavoured with truffle shavings. The 12-hour 98°C slow cooked pig belly with potato and carrot (£11.95) was very good too, with a perfectly crisp and crunchy skin, flavoursome meat and delicate curls of poached and pureed carrot. Finally came the spiced lamb neck with aubergine and couscous (£11.95). The lamb was delicate, flavoured but not overwhelmed by the Maghreb spices (cumin, cinnamon, paprika and saffron), and served with a glossy aubergine sauce. By the time dessert came, we had little room left, but shared a magnificent dessert of banana Financier with maple syrup and banana ice cream (£6.50). This was outstandingly good, beautifully presented with the ice cream sitting on a sweetly crunchy base, and a perfect crisp but almost vanishingly thin layer of caramel on banana slices. We then had a couple of small doughnuts (£1.50 each), which were light and crispy, with a generous dusting of sugar and cinnamon. What We Drank: The wine list is well thought out and very reasonably priced with entry level wines starting from £19.50 and other excellent choices below the £30 mark (including a Rias Baixas Albariño for £25.50). We had a glass of sparkling Pinot Noir 2012 from Cordillera, Miguel Torres, Chile (£5.50 per glass or £25 per bottle) with our appetizers, which was a good aperitif. 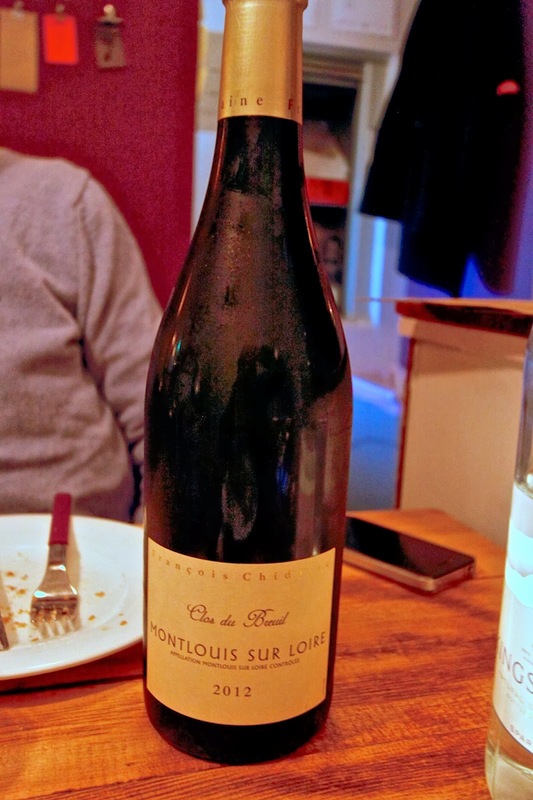 With our main meal, we shared a bottle of Montlouis sur Loire 2012, from Clos du Breuil, F Chidaine (£42). This was a lovely dry Chenin Blanc from Touraine in the Loire valley, with tart green apple flavours and excellent minerality. It stood up well to the range of flavours in our meal. We also had a couple of glasses of 2008 Rioja Reserva Bodegas Ostatu (£8 per glass or £39 per bottle) with the spiced lamb neck. This had blackberry and vanilla notes, and great intensity and depth of flavour. All wines were selected by Arina Graham, the restaurant manager, and were excellent choices in our opinion. Likes: Great cooking by Ed Dutton, very good and well price wine list, casual but tasteful restaurant in the heart of plush Marylebone. Excellent service and the best banana dessert I have tried (Banana Financiers), worth crossing the City for! 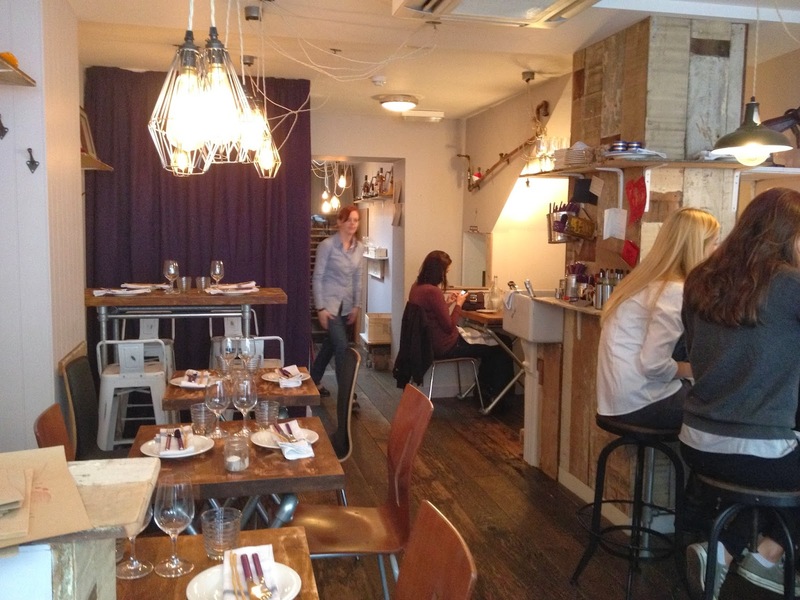 Verdict: An excellent pop-up restaurant in Marylebone, with a well-priced, small but delicious menu and a great wine list. Hurry to get there because it is scheduled to close in April 2014! 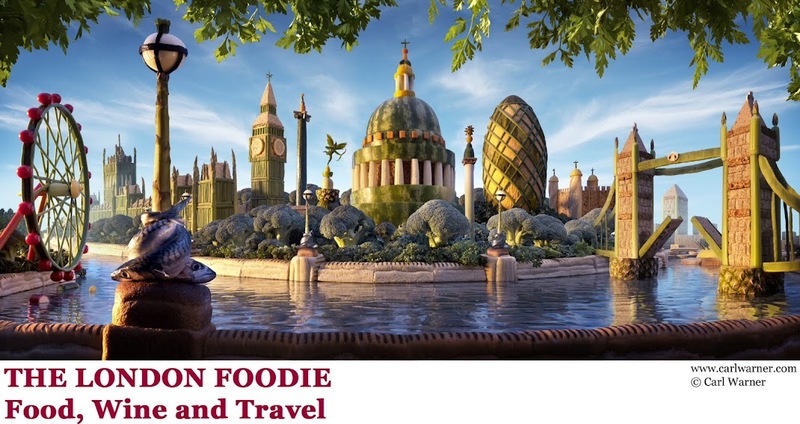 Great set of London food information. Due to London’s size and popularity as a tourist destination, there are a number of accommodation options available. These dishes look like works of art. Another restaurant to add to the 2014 to do list..